With this in mind, you know it’s already tough to decide what you want for dinner. So how is having all of these options going to make it easier? It’s not; but that’s also why man created the buffet. They’re the perfect answer to those indecisive nights. Not sure if you want Chinese or Italian? Try a buffet! A hamburger and a taco sound like they’ll whet your appetite? A buffet will surely have both. It’s the laziest answer to figuring out dinner – but also sometimes the most delicious. You have buffets in mind, now. So which are the best for you to eat at? Harrah’s may not be amongst the elite of Las Vegas anymore, but it still has a lot to offer. Sure, properties like MGM, Cosmopolitan, Wynn, and Encore may look prettier and may have a bit more curb appeal, but if you completely avoid Harrah’s, you’ll be missing out on something good – its buffet. Stepping up to the plate are the chefs at Harrah’s buffet, Flavors. It may not look like it, but this quaint little eatery delivers on its name. The options may be slightly limited when compared to other Strip buffets, but what Harrah’s does deliver on is well cooked and well seasoned. A fresh salad bar offers up some crisp greens while a carving station delivers on moist, juicy meats like turkey and prime rib. Pricing isn’t bad, either, and the convenience of being right smack dab in the middle of the Strip (where all the fun tends to happen) makes this a shoe in. It’s rated as one of the top in the entire city, and it didn’t get there by dishing out bland food. Rio’s Carnival Buffet is a local and tourist favorite, offering up many different serving stations, all stocked with delicious food. 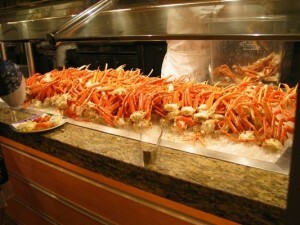 The Carnival Buffet still holds onto some of the fundamentals of a standard buffet with hamburgers, mac and cheese, french fries, and pizza, but it also amps things up with first-class seafood, succulent meat like brisket, and a large salad bar. Rio is a little ways off the Strip, but avoiding this buffet just for that reason is definitely a mistake. The Mirage is a great example of a mix of old and new Vegas. It has the flare of old Vegas with the style of new Vegas. That pretty much sums up Cravings, The Mirage’s signature buffet. There’s nothing standout about what this buffet has to offer, save for on its seafood nights, where most stations are full of fresh shrimp, crab legs, scallions, and lobster tails. Where Cravings lacks in originality it makes up for in flavor. The chefs here clearly knew that they had to deliver on taste if they weren’t going to expand variety, and they did. What you could get at any other buffet, The Mirage amplifies flavor. The carving station doesn’t just serve up meat, it serves up succulent slices of juicy, tender portions. The Chinese section doesn’t just dish out Vegas’ iteration on Chinese food. Authentic flavors find their way into Cravings’ cuisine, separating it from the norm of most buffets. Everything at the Wynn is opulent, from the carpeting to the ceiling, so one would not expect less of the buffet. Delivering on 15 different cooking stations, Wynn pulls in flavors from all over the world to make sure there is a little something for everything. The decor amplifies your time at the buffet from just a simple dining occasion to a memorable experience. From Alaskan King Crab to fresh made crepes, The Buffet does not fail to deliver the utmost in flavor. Appetizers, entrees, desserts – The Buffet excels in every portion. Now if only they would let you take out a small doggie bag. You may have heard of this eatery before, and there’s probably one reason for it – the Mac and Cheese bar. Nowhere else on the Strip can you get a certified Mac and Cheese bar that isn’t catered to kids. Jalapeños, bacon, onion, tomatoes, and many different types of cheese are just a small portion of what you can have thrown in your metal crock of macaroni. If you can look past the mac and cheese bar, you are going to find yourself faced with a plethora of delicious looking options. Delicious looking and, of course, delicious tasting. The Wicked Spoon’s chefs took care with each and every selection, from the peeking duck to the bone marrow, to make sure that the flavors pop and are unique. The only drawback, though its food more than makes up for it, is that it is the most expensive buffet on the Strip. Still. Well worth it.